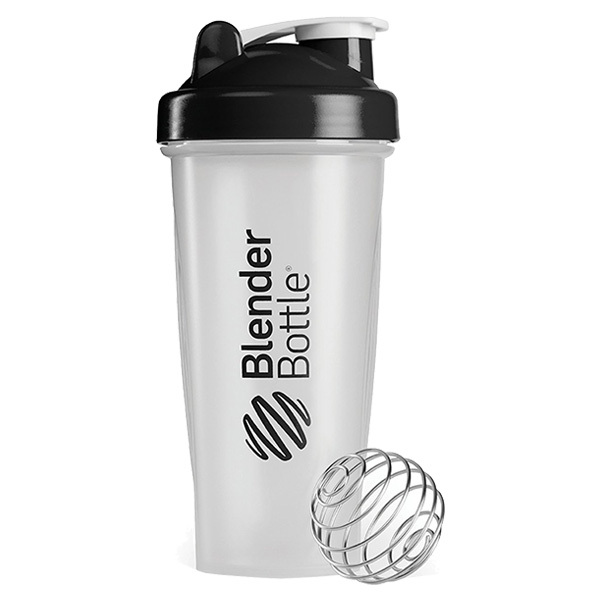 The secret to the Blender Bottle is the patented Blender Ball that moves around in the bottle when you shake it. It easily mixes the thickest ingredients, even if you’re mixing powder and liquid ingredients together. You just shake it and drink……or pour! Ever since 18th-Century Shaker cooks used bundles of peach twigs to add peach flavor to cakes while they whipped the batter—and probably even before—gourmet cooks have understood the value of a whisk. A whisk blends and mixes ingredients and adds air at the same time, resulting in a light, fluffy, smooth concoction to bake into a cake or drink through a straw. Now someone has finally come up with a way to blend smoothies and other ingredients without hauling out a blender or other appliance that’s a nuisance to fit on the counter, plug in, clean up, and put away: the Blender Bottle. Two different sizes of the Blender Bottle are available. The 28-ounce version is great for salad dressings, drinks, sauces, and other cooking uses. It’s marked for amounts of 8 to 20 ounces, and holds 28 ounces when filled to the rim. Two different sizes of the Blender Bottle are available. The 28-ounce version is great for salad dressings, drinks, sauces, and other cooking uses. It’s marked for amounts of 8 to 20 ounces, and holds 28 ounces when filled to the rim. The smaller 20-ounce bottle is a good travel size for drinks. It’s marked to 12 ounces but holds 20 ounces when it’s filled to the rim.The Blender Bottle makes it easy for you to mix smooth drinks, batters, salad dressings or anything else without dragging out the blender or making a mess in the kitchen. And it’s great for office or travel use. It has a secure, And it’s great for office or travel use. It has a secure, screw-on lid with a wide opening so it’s easy to add ingredients. The large pour spout means you can use it for pancakes or other recipes where you need to pour out a portion at a time. And the StayOpen flip cap keeps the lid out of your way when you’re adding ingredients.